Totally redesigned for maximum performance and ease-of-use, Easy CD & DVD Creator Platinum is the only PC-based integrated software suite that includes feature-rich digital media applications desired by today's "digital consumer" to capture, edit, manage and burn photos, videos, music and data to CD or DVD. Among the most compelling applications in Easy CD & DVD Creator Platinum is DVD Builder. 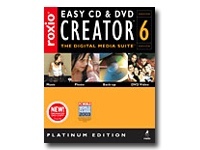 Roxio's DVD Builder allows users to easily capture, edit and combine video and photo to create Hollywood-style DVDs of users' home movies and photo slideshows on CD, VideoCD, SVCD or DVD. Easy CD & DVD Creator also boasts a sleek new user interface to empower users of all skill levels to enjoy creating, copying, and customizing CDs and DVDs.